London/New York: Central banks from Bogota to Mumbai are imposing foreign-exchange curbs to take control of their soaring currencies from traders dumping the dollar. In Colombia, international investors buying stocks and bonds must leave a 40% deposit at Banco de la Republica for six months. The Reserve Bank of India has created a bureaucratic thicket to curb speculation by foreign money managers. The Bank of Korea is investigating trading of currency forward contracts to limit gains in the won, now at a 10-year high. Instead of using currency reserves or interest rates to influence foreign exchange markets, central banks and finance ministries are setting up obstacles to keep the falling dollar from threatening company profits and economic growth. The US currency slumped 10% this year against its biggest trading partners, the steepest decline since 2003, while treasury secretary Henry Paulson has reiterated that the US supports a “strong" dollar. The US hasn’t attempted to stop the decline as the worst housing slump in 16 years forced the Federal Reserve to lower interest rates. The dollar has weakened 19% against the Canadian currency this year to a record 90.58 cents, and fell 18% versus Brazil’s real. The euro strengthened 1.2% last week and reached an all-time high of $1.4752 on 9 November. The yen rose 3.6% last week, and it touched 109.85 per dollar Monday before closing at 110, the highest since May 2006. An index tracking the dollar against seven major trading partners dropped to 71.11 on 2 November, the lowest ever, a week after the Fed reduced its target rate for overnight loans between banks by a quarter percentage point to an 18-month low of 4.5%. Stephen Jen, head of currency research at Morgan Stanley in London, said on 2 November that the dollar’s slide threatens to turn into a “more violent correction" that may require joint intervention by the US, European Union and Japan. The dollar will trade at $1.51 per euro by year-end, Jen said on 8 November. The extent of the dollar’s slump reminds some traders of 1973, when former president Richard Nixon’s treasury secretary John Connally abandoned the gold standard while the US was in recession and inflation exceeded 10%. The dollar lost 40% against the yen in the next five years. Since 2002, the US currency has fallen 40% against the Canadian dollar, 33% versus the euro and weakened 24% compared with the British pound. There’s little evidence that this year’s decline is hurting the economy. Gross domestic product increased 3.9% in the third quarter, the highest since March 2006, the commerce department said on 31 October. The annual inflation rate was 2.8% in September, the labour department reported on 17 October. The US trade deficit unexpectedly narrowed 0.6% in September to $56.5 billion, as exports increased 1.1%, the commerce department said on 9 November. 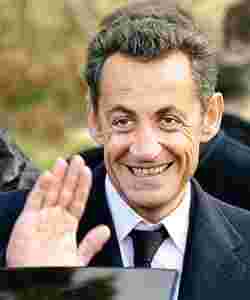 ... while French President Nicolas Sarkozy said the US must stem the fall or risk a trade war. The pain is being felt elsewhere. US sales for Hyundai Motor Co., South Korea’s third biggest exporter, may decline for the first time in nine years with the won the “No. 1 obstacle," vice-chairman Kim Dong Jin said in an interview last month. The won’s 3% gain in the past year helped send Hyundai’s shares down 9%. Infosys Technologies Ltd., India’s second largest software exporter, cut its full-year earnings forecast on 11 October, blaming the rupee’s 13% rise. The shares fell 24% this year. India may miss its $160 billion target for exports in the year through 31 March as local goods become more expensive abroad, commerce secretary G.K. Pillai said on 8 October. Munich-based Bayerische Motoren Werke AG, the world’s biggest manufacturer of luxury cars, and Paris-based Hermes SCA, the maker of Kelly and Birkin handbags, blamed the currency market for disappointing profits. 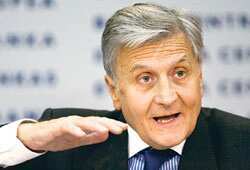 European Central Bank president Jean-Claude Trichet said on 8 November that the decline in the dollar has been “brutal," while Canadian finance minister Jim Flaherty said he’s “concerned" by the surge in his currency. French President Nicolas Sarkozy told a joint session of the US Congress on 7 November that the Bush administration must stem the dollar’s plunge or risk a trade war. “The weaker dollar causes central banks to look at foreign inflows differently," said Robert Fullem, vice-president of US corporate-currency sales at Bank of Tokyo-Mitsubishi UFJ Ltd in New York. “The market is pushing the central banks into corners. I don’t have faith in them. They may have to push the envelope further," he added. Trading on Colombia’s stock exchange fell 27 % to an average 80 billion pesos ($39 billion) a day as the finance ministry struggled to control the dollar’s 10% decline. The finance ministry imposed controls on short-term capital in May by requiring foreign buyers of stocks and bonds to deposit 40% of their purchases with the central bank for six months. If the peso weakens, investors won’t be able to pull out until the period has expired unless they pay a fee of as much as 9.4% of the investment. “New mechanisms need to be considered because the exchange rate is affecting us a lot," Colombian President Alvaro Uribe said in a 9 May speech in Medellin. “It’s absolutely frustrating," said Urban Larson, who co- manages about $500 million for F&C Investments in Boston. “The currency control is keeping foreign investors on the sideline. It’s unfortunate because there are a lot of attractive stocks in Colombia and the economy is quite good." Overseas investors have bought $18.8 billion of stocks and bonds in India this year, double the previous record in 2005. 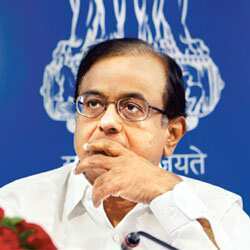 The increase “is building bubbles" in the country’s stock market and real estate, finance minister P. Chidambaram said last month. Foreign companies licensed to invest in India can only issue participatory notes, or offshore derivatives linked to local stocks, backed by 40% of the shares they hold. They were barred from selling notes backed by other derivatives, contracts whose values are derived from other assets. Trading on India’s Sensitive Index, or, Sensex was suspended and $120 billion of its market value was wiped out in a minute on 17 October, when the regulator proposed the measures. The Bank of Korea and the Financial Supervisory Service said on 23 October that they will study forward currency transactions by exporters and financial companies. Companies use forward contracts to lock in exchange rates at a future date, helping fuel gains in the currency. “We need to find out the cause of excessive forward sales," said Park Shin Young, an economist at the Bank of Korea. Inter-bank transactions jumped to $850 million a day in the third quarter, up 35% from the previous three months, central bank data show. Policymakers told parliament in October that they will probably lose more than $1 billion for a third year because dollars purchased to stop the won’s advance earn less interest than the bonds sold to control money supply. “Central banks are trying noninterest rate methods to stabilize growth and capital flows," said Bank of Tokyo- Mitsubishi’s Fullem. “It’s something extraordinary. They haven’t used these venues for a long time. It’s sort of the last resort the central banks would like to tap." Andrea Jaramillo in Bogota, Adriana Brasileiro in Rio de Janeiro, Kyoungwha Kim in Seoul, Cherian Thomas in Delhi and Wes Goodman in Singapore contributed to this story.